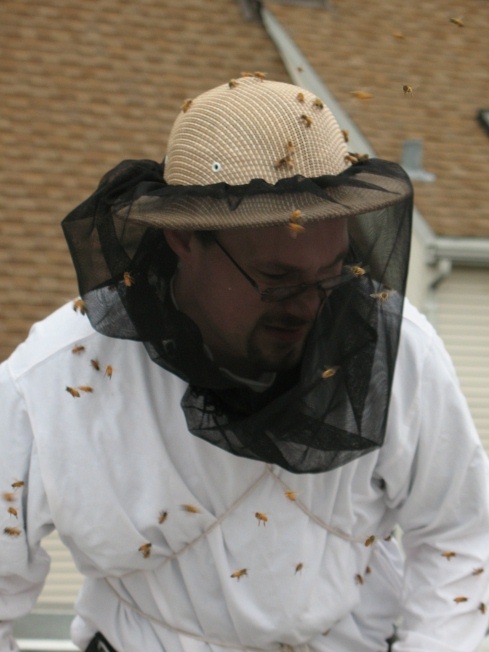 Just a quick note–our state registration information has arrived, so I’m now an officially registered beekeeper. Not that I think that’s a necessary distinction, but it means we’re all legal now. Thankfully, the bees are doing a good job of keeping out of the way, and flying pretty high from the roof. On Thursday night, a few of our errant bees got into an exhaust fan leading out of the restaurant’s prep kitchen–all the way into the basement. Helen called, and Joe and I went over to the roof Friday night, and moved the bees a little farther away from the vents. They’re exhaust vents, and so the bees shouldn’t be able to get it, but one of them apparently had a weak damper or something. So to be sure no one in the restaurant would suddenly get a bee invasion when they were slicing strawberries, we moved them farther away from the exhaust fans. Saturday was forecast for bad weather, cold and rainy, and the exhaust repair people were coming, so I closed up the hives until later Saturday and made sure they had enough sugar water. It’s essential to give the bees enough to eat as they’re establishing the hives, both pollen or pollen substitute and sugar water, so they can start building up their populations for when a real honey flow comes in. Both hives had eaten their fill Friday. Saturday night, I checked them again and fed them, although the northern hive didn’t seem as hungry as it should have been. That worried me a bit, but I let it go until I could do a quick check on Sunday. On Sunday, my sister Dolores and I went over and checked the bees. 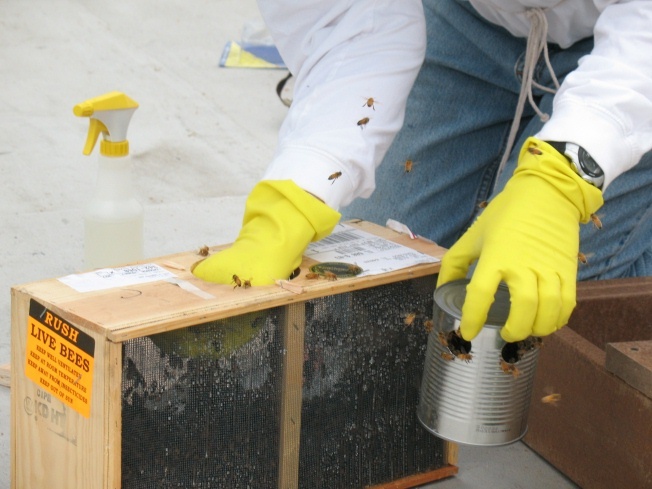 Both hives were buzzing with activity, and had started to draw out comb. South built burr comb on the queen cage, which when you put it in is suspended between two frames, in the place where you’d usually put a 10th frame. If you keep only 9 frames in while the bees are first filling the hive with comb, you’ll get all sorts of burr comb. And that makes it hard to work with the hive, defeating the purpose of a Langstroth hive. Anyway, both the queens were out, and the girls were doing well, so we didn’t linger. 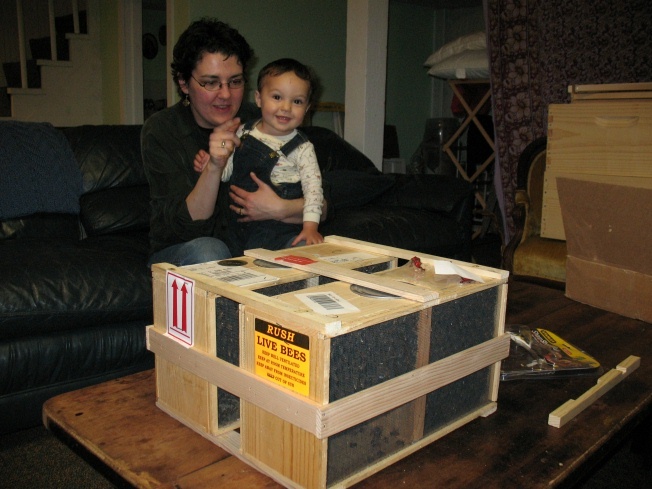 So, the bees arrived Wednesday, and they facinated our son, Milo. He’s been enthusiastic about hats since he first noticed them, and gets gleeful every time he sees a bee veil and panama hat. He calls them “hat bees.” Perhaps he associated the bees with the hats, because he found them intriguing too. Here he is with my wife, Ann, saying hello to them. The bees hung out in our basement, as I fretted over the weather. But everything turned out well. Ann had put a final coat of paint on the two beehives Tuesday night, and about 12:30 Thursday, I drove over to my old roommate and friend Joe Ronne’s house to pick him–and his tools–up so we could build a platform for the bees, which we were planning to install about 3 p.m. with Helen. Using some recycled plastic and wood plants left over from Uncommon Ground’s building a deck on their roof, Joe assembled a more than serviceable frame for the two hives to sit on. Helen was at the restaurant for a meeting, and she and the two folks she was meeting came up to the roof to discuss the rooftop garden while we were finishing up. After Joe and I ran to the store to get something to keep the queens in their cages for a little bit after we hived the bees, (I ended up using caramels) I went home and we got the bees. We brought them into the restaurant and showed the staff, asking to have Helen come up to the roof. The installation went pretty well, with a few minor exceptions. I remembered to spray them well with sugar water before taking them out. Joe got some good pictures of me undoing the packages and taking out the queen in one. It took a minute to get the queen cage out, because the feeder can was full of bees. But I got her out, showed Helen the queen, then put the queen cage in between two frames. I jarred the package so the bees would be more pourable, and shook a lot of the bees around the frames where the queen was. I then shook out the rest of the bees into an open space without frames. I got set to replace the missing frames. If you’re a beekeeper, you might notice that I skipped a step there. After I’d put most of the bees in the first hive, Helen asked how the queen was going to get out through the cork in her cage. She can’t. 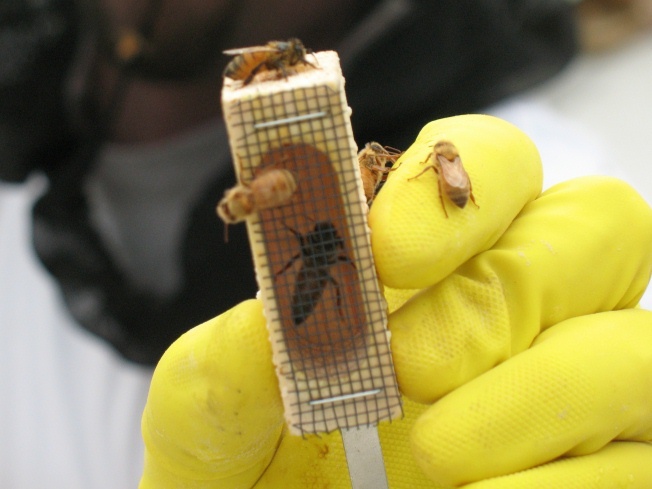 In older queen cages, the queen will be sequestered with a couple attending bees, and there will be a hole at each end of the cage. Both have corks, but one is filled with candy, and you take the cork out at that end and the bees eat through the candy to release the queen. In this one, there was one hole, and just a cork. I’d meant to replace it with a caramel, and forgotten! So I took the cage out again, removed the cork and put a small piece of caramel in to block the entrance. Then, with the queen in her rightful place, I brushed some accumulating bees off the inside of the hive body, and started replacing the frames. Or almost did. In one of the other minor mishaps, I’m using a type of veil I haven’t used before, and so I hadn’t fastened it quite as well as I should have. A few of the errant bees got under the veil, and one got stuck in my hair. (This was a frequent problem when, as a teenager, I would occasionally give my hives a quick check without a veil.) That resulted in a sting, and I got three more, one on my chin and two on my neck, before the veil problem was solved. All in all, though, the hiving was successful. I’d selected Carniolan hybrid bees because of their reputation for docility, and they’re living up to it. We gave them some sugar water, I took some pictures of Helen and Joe next to the hives, and we were beekeeping! On a rooftop, keeping bees….The bees aren’t in Rogers Park, but they’re two blocks away, and that’s where I am, thus the name. Because of nickname someone gave me a while back, I’m using the signoff of “Slim,” but I’m really Liam Ford.